WASHINGTON -- The US envoy for North Korea met with his Russian counterparts Tuesday to ensure full coordination on efforts to dismantle the North's nuclear weapons program, the State Department said. 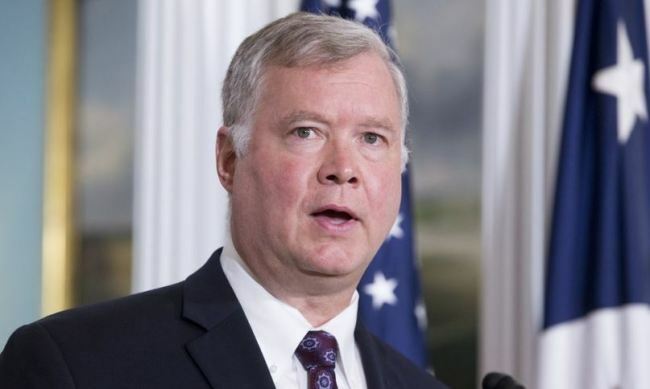 Stephen Biegun, US special representative for North Korea, held talks in Moscow with Russian Deputy Foreign Minister Igor Morgulov and Deputy Foreign Minister Sergey Ryabkov. The three men discussed efforts to achieve the "final, fully verified" denuclearization of North Korea, a department spokesperson said, and the conversation was "warm and friendly and explored a number of areas of cooperation." "The United States is committed to working with interested parties, including Russia, on the robust and sustained implementation of UN sanctions in order to move forward with denuclearization," the spokesperson said in response to a Yonhap query. Biegun "emphasized to his counterparts the need to continue fully coordinated communication to ensure that denuclearization proceeds as quickly as possible and permit the steps that will create a brighter future for North Korea," she added. As permanent members of the UN Security Council, both the US and Russia backed the adoption of multiple sanctions resolutions last year to cut off funding for Pyongyang's development of nuclear weapons and ballistic missiles. But in recent months Washington has accused Moscow of assisting Pyongyang in violation of those sanctions, including in illegal oil transfers at sea.